Report from the Hamilton Tenants Solidarity Network about their ongoing rent strike. Dozens of Stoney Creek Towers rent strikers and their supporters from across Hamilton (as well as fellow tenants from Parkdale Organize in Toronto) rallied outside the Landlord & Tenant Board this morning. 33 tenants have a hearing scheduled this morning, the first of several scheduled for this month. 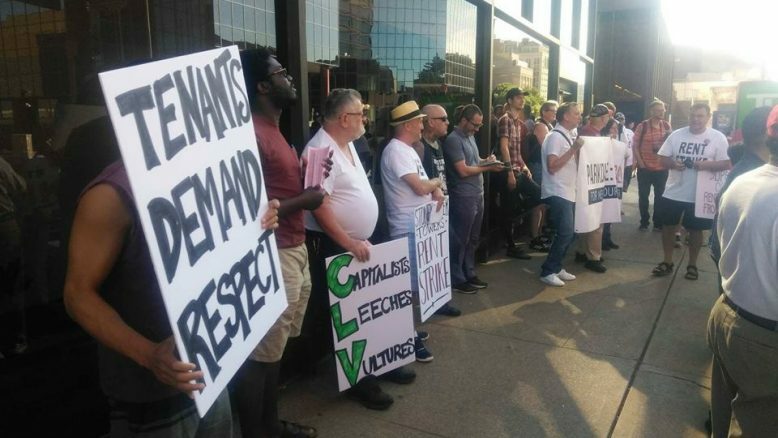 Landlord InterRent REIT and property manager CLV Group are attempting to use the legal system to pick rent strikers off one by one, pretending that non-payments of rent are individual errors rather than an organized, collective protest. Tenants are not scared and have rallied in big numbers to occupy the LTB and halt the proceedings. Tenants across Hamilton know that the LTB tends to favour the landlord over the tenant. Landlords like InterRent, Effort Trust, Homestead, etc. have an army of paralegals that process hundreds of tenants every month. The LTB is an eviction machine, helping landlords make profits rather than helping people maintain shelter. We are here today to protest landlords like InterRent that make money by displacing working class people from their homes. We are here to protest the LTB system that makes this money-making possible.